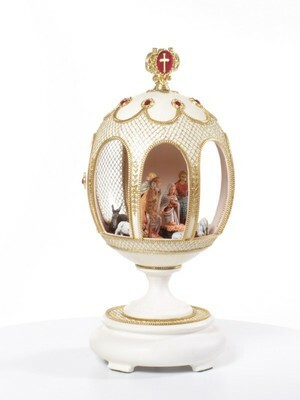 Music box shaped like an egg features a cut out center, which houses a nativity scene featuring Mary, infant Jesus, and other onlookers. The music box is mostly white with gold trim, and a gold and red cross on top of the egg. The base of the music box appears to be made out of wood.